Next, we have the “Tarman” YouZhas from Monsterfoot Creations. 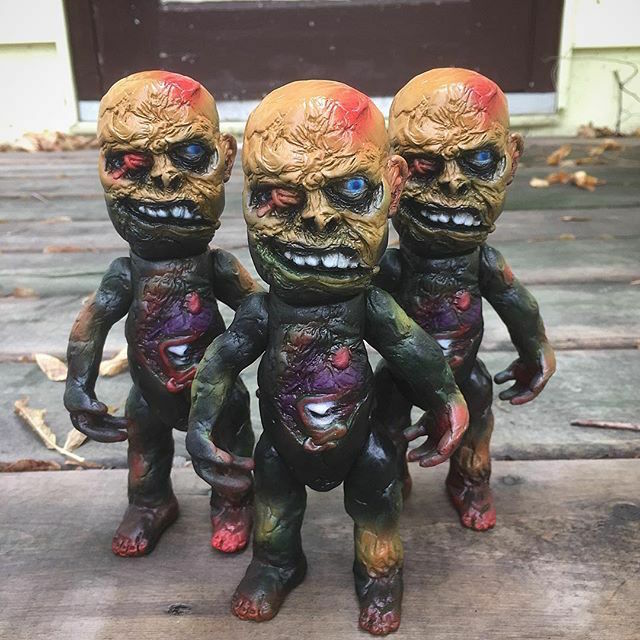 Inspired by Night of the Living Dead’s infamous trioxin-ated zombie, these guys have been lovingly painted in a grimy mix of black and tan sprays with contrasting purple and red highlights. Limited to an edition of just 3 pieces, expect these in the Monsterfoot Creations store later this week for an undisclosed sum… Keep an eye on both Mechavirus‘ and Monsterfoot‘s Instagram feeds for full release details soon! This entry was posted on October 6, 2015 by trutek. It was filed under horror, sofubi, vinyl and was tagged with kearjun, mecha, mechavirus, monsterfoot creations, sofubi, tarman, vinyl toys, youzha, zombie toys.